We are delighted to add the UK-designed and manufactured Instromet weather stations to our portfolio of weather products. If you’ve ever wished for a genuine ‘Made in UK’ weather station that combines good looks and decent accuracy & quality with reasonable cost then the Instromet stations must be the products of choice. Instromet stations have a long pedigree within the UK weather community with their highly distinctive blend of retro-look display (analogue dials and a polished wood case) but fed, behind the scenes, with live data from modern electronic sensors and circuitry. The Instromet Climatica model offers, in addition, the latest data logging features plus the potential to upload data automatically to a live weather website via a PC. The display is undoubtedly the eye-catching feature of these stations. It is very impressive ‘in the flesh’, measuring some 390mm long by 178mm high (roughly 15″ by 6″) for the Climatica model — still compact enough to place on a desk or on a wall in a smaller room, but also large enough to make a readily visible focal point within, for example, the clubroom of a sailing or golf club. The flicking of the large analogue wind dials with each wind gust is fascinating to watch in breezy conditions and is a compelling reason, in its own right, for wanting to own an Instromet station. In addition to the large analogue dials, the display can also contain (as shown above) a clear and attractive LCD panel which provides a user-selectable readout of current values from other weather sensors such as temperature, humidity and rainfall. The Climatica model is also unusual amongst more affordable stations in offering the option of true Sunshine Hours recording. Note that the Instromet models are all cabled weather stations, with the outside weather sensors cabled to a central control box, with a further cable onwards to the display location. Instromet stations are individually hand-made to order, with some customisation possible as to finish and to the sensor complement, and delivery is typically possible within about 10-14 working .days. The Instromet range has recently undergone major updates to the electronic circuitry and display and the range has been reorganised, now comprising two main models: the entry-level Atmos and the more fully-featured Climatica models. These web pages give an introduction to the Instromet stations and their sensors, but please contact us if you have further specific questions. 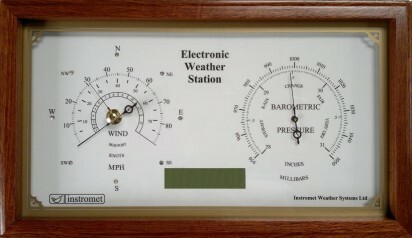 The weather station display is the most distinctive feature of the Instromet stations. The image at the top of this page shows the advanced 3-dial display for the Climatica models. All Climatica displays also contain an LCD panel — the ‘Multi-Weather Display (MWD)’ — below the central dial, which provides a clear and detailed text readout of measurements from the other weather sensors. The Atmos models have a similar but simpler 2-dial display (see image right). On the Atmos displays, the MWD LCD panel is optional and there is a further option whereby the two dials can be selected from wind speed + wind direction or wind speed + barometric pressure (with wind direction indicated by an outer ring of LEDs around the wind speed dial). The image here (click image to see larger version) shows the Atmos LT model’s display with the speed + pressure layout and the LCD panel. Weather readings can be seen in multiple units either via different scales on the analogue dials or with selectable units on the LCD display. All Instromet stations are currently cabled stations. In these stations, the weather sensors are individually cabled to a control box, which contains all the circuitry to run the weather station (see image left, showing control box with lid removed), other than the display itself. This control box also contains the data logger (if specified – see below for further details) and any supplementary interface circuitry plus the electronic pressure sensor (where specified). This control box is therefore effectively the heart of an Instromet station (and, on Climatica nodels only, can run the station autonomously, ie without a display being connected, provided a logger is fitted to provide a PC interface). The display unit is then connected to the control box via a cable connection. Long cable runs are possible, if required, for all cables and so there is considerable flexibility about the relative locations for sensors, control box and display. The control box is not formally weather-proof (the mains power supply input is the main non-weather-proof connection) and so should not be sited outside, but any dry and sheltered location should be suitable. Power to the complete station is provided via a power input to the control box; neither the sensors nor the display need separate power — their power is provided over the cable connection back to the control box. Atmos models are limited to anemometer, air temperature, analogue pressure and rainfall as compatible sensors. More details on the various sensor options and permitted combinations can be found on the Instromet Sensors page. 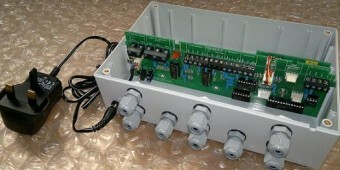 The data logger is an additional PCB option (see image right), which is easily installed into the Climatica control box. The logger has an RS232 serial output as standard for connecting to the PC but can be supplied with either an internal or external serial-to-USB adapter. The communications protocol between logger and PC is freely and publicly available for anyone wishing to create their own software. Please contact us for further information about the logger and software.